Stacy Horn » Blog Archive » Dead LAST! 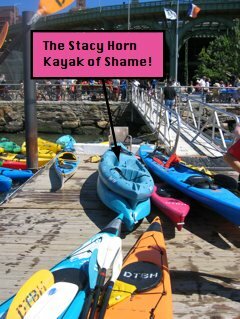 I entered my first kayak race, the Harrison Street Regatta, (sponsored by The Downtown Boathouse) and came in last. Dead last. 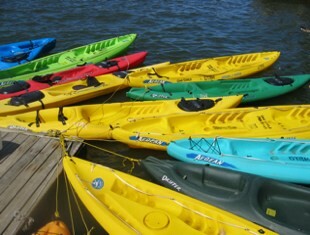 That is the actual kayak I raced in to the left. I was ten minutes behind everyone else, maybe more, maybe a lot more, but at least I finished!! I’m quite proud to tell you the truth. 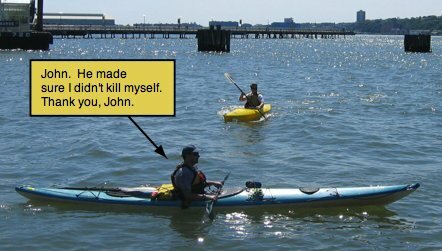 In my defense: I went out on a kayak for the first time, what? Two weeks ago? Or was it last week? Plus, my oar was messed up (seriously). And the wind was against me. Okay, it was against everyone, but I’m a weakling to begin with, so, ah, yeah. I feel great. It was a beautiful day and a perfect thing to do. I’m going to pay tomorrow. But maybe all my gym work will save me and I won’t ache too badly. One sad note, I was walking home and there was a big fire downtown, and it looked like it was in the exact same spot as the Trade Center. Of course it brought it all back to see the smoke, and I swear I could smell that smell. Sure enough, I just looked it up and it’s the Deustche Bank. That was one of the buildings surrounding the site. It was coming down anyway, but still. Anyway, the race was a mile, and I practically collapsed at the end of if and then I learned we had to row BACK. I almost burst into tears. But they gave me a narrower and faster boat to row back with and an oar that wasn’t messed up and I was fine. Volunteers rowed on the sidelines, making sure everyone was okay, and this poor guy got stuck with me, because I was so far behind everyone else. He was very nice about it. 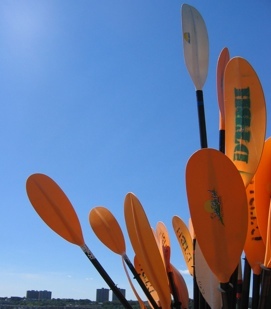 And a bouquet of oars. It’s amazing how long a mile can really be isn’t it? Especially on water with the wind against you & a messed up oar! But, good for you to get out there in a race after just recently trying kayaking. I wanted to ask if the kayak you used in this race is an inflatable. It looks like it is from the picture. My sister and I got one for two this summer and it’s very hard to manuever and seems to have a mind of it’s own. Of course, our kayaking skills don’t help matters. With a better kayak & the oar correctly assembled, I bet you’ll do much better next time around. Great shot of the bouquet of oars by the way. Have you been watching “Damages”? No, the kayak wasn’t inflatable, but there was one inflatable out there and I noticed the people were struggling with it, although they still managed to beat me. But they were second to last. And no, I haven’t watched Damages! Should I? I heard something about a dog that scared me off. I have the same reaction when any harm comes to animals in TV or movies even if it’s all fake! I can’t bear it. In maybe the second show of Damages, there was one brief scene of the result of someone doing something bad to someone’s dog. However, the show is really good, although rather creepy at times, more because some of the characters are rather unsavory. Lots of twists and turns. Glenn Close is great, in conniving, evil kind of way. The show took me surprise and I now really look forward to it each week. It’s mainly flashbacks to show what happened leading up to a murder. You see current day happenings briefly, then it moves on to the story. You should definitely check it out. Maybe there’s an episode guide out there to help catch you up.